Initial D Arcade Stage 5 is the fifth game in the Initial D arcade racing game series. It is based around the Initial D Manga series. A few notable differences include heavy physics changes; the addition of Toyota Supra (JZA80); the re-addition of the Toyota MR-S, Roadster RS (NB8C), and the Mitsubishi Lancer Evolution VII; and a new Nagao mountain. 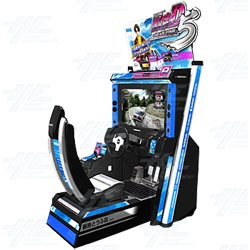 Initial D Arcade Stage 5 is the fifth game in the Initial D arcade racing game series. It is based around the Initial D Manga series. A few notable differences include heavy physics changes; the addition of Toyota Supra (JZA80); the re-addition of the Toyota MR-S, Roadster RS (NB8C), and the Mitsubishi Lancer Evolution VII; and a new Nagao mountain. SEGA has unveiled the first trailer for Initial D 5, which offers the same intense racing action as its predecessors along with some new modes.